Is Kelsey Plum the Best Player in NCAA Womens Hoops? The Numbers Say So! As we take a look at what is to come here in Dallas during the Womens Final Four, you have to take a hard look at Washington Point Guard, Kelsey Plum, who is most likely going to be representing her team as one of the teams in the Final Four this year. But is she the best player in the D1 relm this season? Most people would give her the nod, and so will we, as she most likely will not only be noted for becoming the number one scorer in NCAA Women’s hoops history, but could add a ring to it as well. After she broke the record, athletes from all over sports took to Twitter to give her much due respects for becoming one of the best to hit the courts and that list includes some pretty impressive names. Mystics Forward, Elena Delle Donne said she could not wait to see her become part of the W, in reference to the WNBA this upcoming May. Plum finished with 57 points in Washington’s 84-77 win over Utah, giving her 3,397 in her career, four more than Jackie Stiles’s old mark. She shot 19-28 from the field in a dominant performance, finishing the first half with 22 points as the Huskies led 40-35. Plum was the fastest player to 1,000 points in Washington history, hitting that milestone as a sophomore. As a junior she became the fastest player in Pac-12 history to hit 2,000 points, a record she reached on Jan. 31, 2016 at Cal. 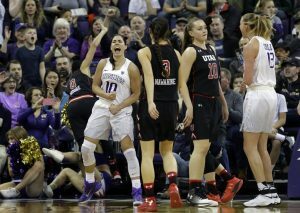 But her all-out assault on the scoring record books really started last postseason, when the Huskies put together a surprise run to the Final Four, the first in Washington history. Those extra games gave Plum a shot at passing the numbers Stiles put up over a four-year career at what was then known as Southwest Missouri State.